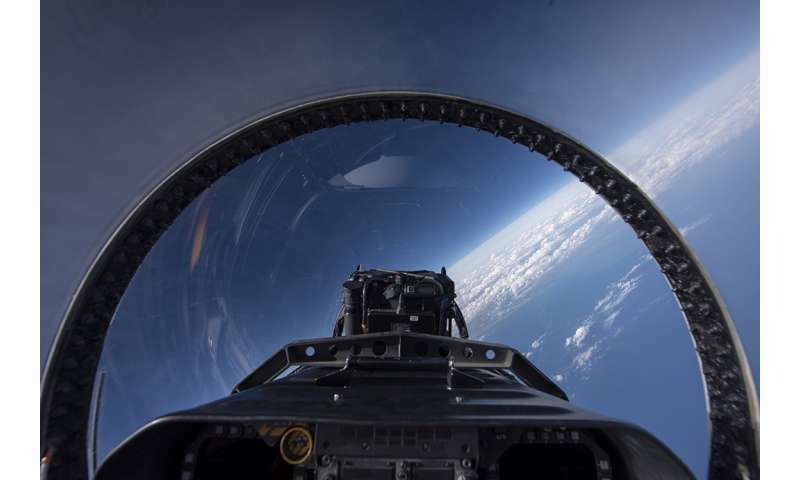 This image of the horizon was seen from the cockpit of NASA Armstrong Flight Research Center's F/A-18 research aircraft during a flight in support of the Quiet Supersonic Flights 2018 research series, or QSF18. NASA test pilots performed the quiet supersonic dive maneuver off the coast of Galveston, Texas, creating a quieter version of the sonic boom to obtain recruited community survey feedback data. The test pilot climbed to around 50,000 feet, followed by a supersonic, inverted dive. This maneuver creates sonic boom shockwaves in such a way that they are quieter in a specific area. Meanwhile, NASA researchers match community feedback to the sound levels of the flights, using an electronic survey and microphone monitor stations on the ground. This is preparing NASA for community response models for the future X-59 QueSST.